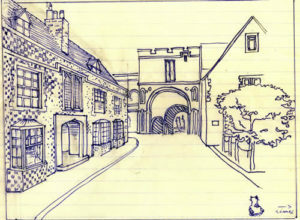 One of Patrick Leigh Fermor’s designs for Mitchinson’s House 1979; his own house, The Grange, is on the right. One of the finest prose stylists I’ve ever read, although it is very rich stuff. Best to pack all twenty volumes of the OED in your knapsack if you want to read this on the subway and fully appreciate the breadth and zest. One of my favorite parts was the description of St. Vitus Cathedral in Prague beginning as he enters the building: “The last of the congregation were emerging to a fickle momentary sunlight. Indoors, the aftermath of incense, as one might say with a lisp, still floated among the clustered piers. Ensconced in their distant stalls, an antiphonal rearguard of canons was intoning Nones.” It goes on for five or six pages of sentences and phrases of playful exuberance that narrowly and sharply abut equally many of solemn elegance and poetry. 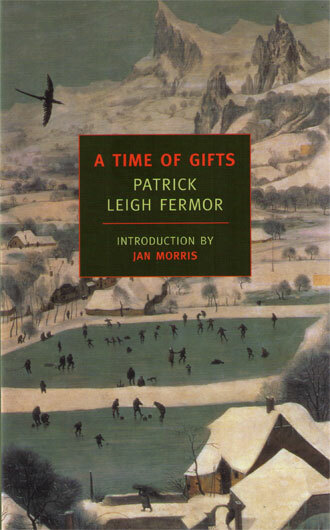 In all, Fermor’s joyful linguistic lubricity rises but never disturbs his soaring genius for aphoristic and sensual description. It’s technicolor prose, really. There’s a lot in this book. Konrad spoke English with eccentric and archaic flare. I love that line. Thanks, NYRB Classics for bringing us back another glorious tome. 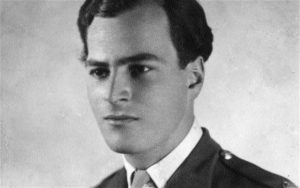 This entry was posted in belles lettres, biography, nonfiction, travel and tagged artist journey, czechoslovakia, eastern europe, europe, germany, holland, hungary, nazis, polders, world war II. Bookmark the permalink.